In the November 2012 (Vol. 60, No. 5) issue of the American Journal of Kidney Diseases, a special series of 24 editorials commemorates the impact of the National Kidney Foundation’s Kidney Disease Outcomes Quality Initiative (NKF-KDOQI) 2002 Clinical Practice Guidelines for Chronic Kidney Disease: Evaluation, Classification, and Stratification on the 10th anniversary of its publication. 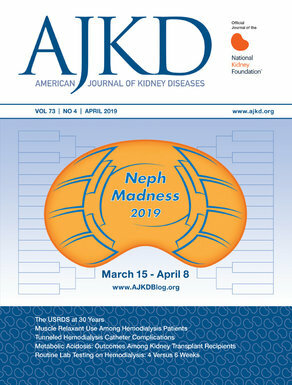 All of the editorials in the special series, including the introduction, are freely available at the journal’s website, www.ajkd.org. NKF-KDOQI is still going strong and just published the 2012 update to the KDOQI Clinical Practice Guideline for Diabetes and CKD, which is also freely available in AJKD’s November issue.